This is a project that I completed around six years ago for a client and dear friend. The couple had just purchased a very cute bungalow type house in the Laurelhurst neighborhood that had a large, vaulted attic space which was livable as-is but was essentially just one very large room covered in knotty-pine panelling. They had a little boy at the time but were hoping for more children in the future. 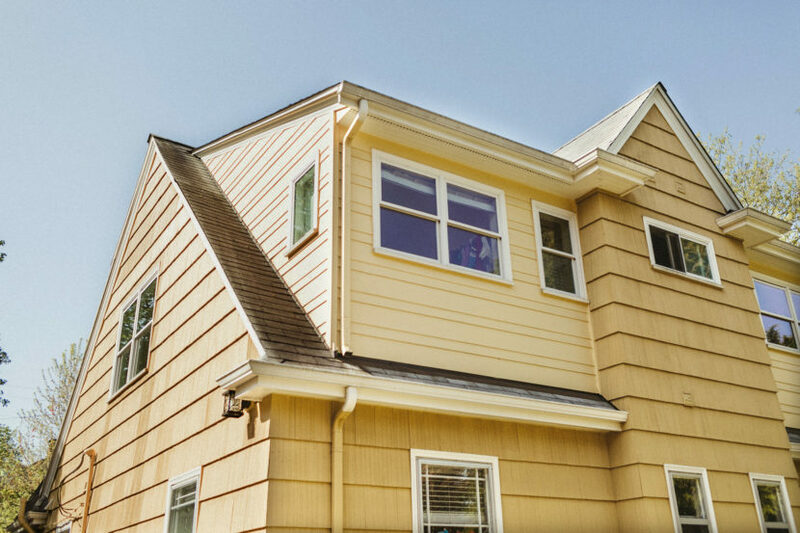 By adding a large shed dormer on the back of their home, we added a master suite and two bedrooms – one large, one small. The large bedroom was attached to an original gabled dormer on the front of the house. 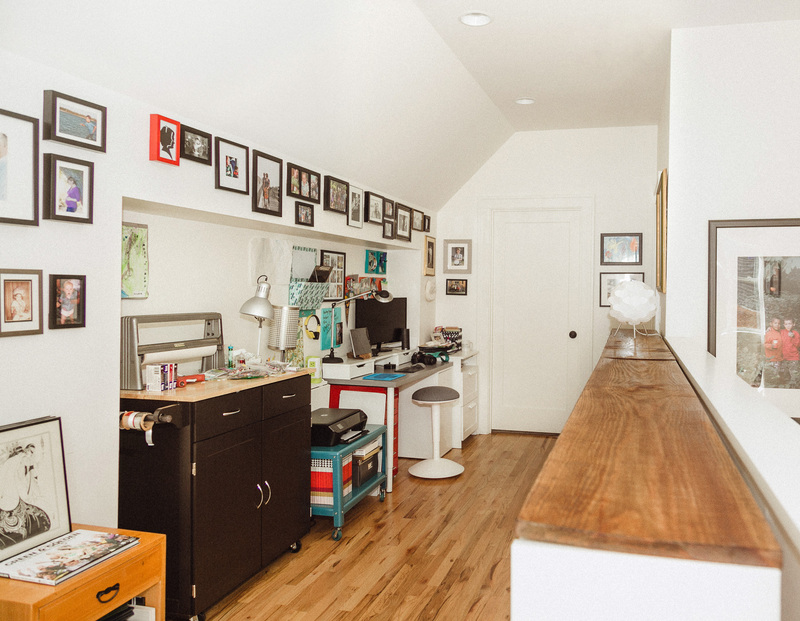 Here’s a gallery of “before” imagery just to get a sense of the existing space. Great head height and a very good stair made this project easy to kickoff. We stacked the new master bath above the existing main floor bath and both bedrooms also stack over main floor bedrooms. In order to construct such a massive dormer, we needed to upgrade the structure with a new beam at the ridge and posts embedded in the end walls. It was pretty exciting to see that beam get craned into place! These construction photos give you a sense of the scale of the dormer and the building process from start to finish. Let’s go to the inside! As I said, I completed this some years ago and in the meantime this family added two more little ones. 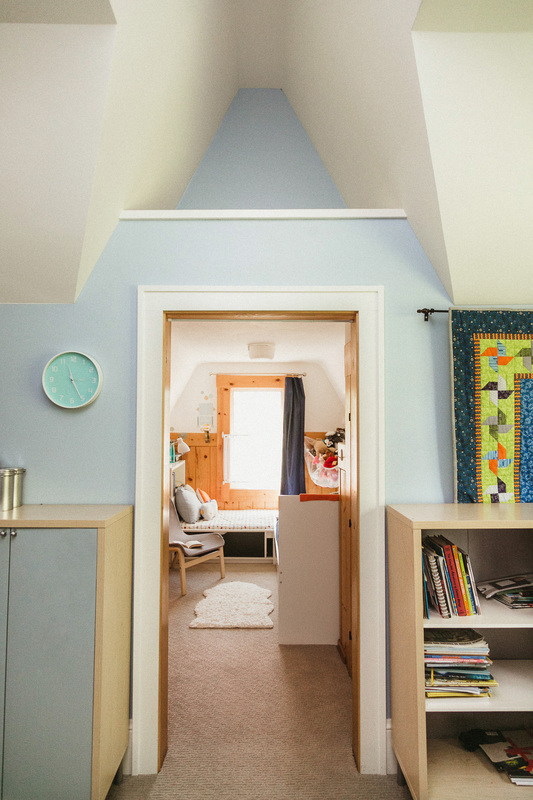 The boys share the larger bedroom with cool front dormer, and the baby took over the new bonus room with the cheek window. To make the most of the new hallway, we added a niche into the pony wall which has become the craft-landing zone, art gallery and workspace. Shelves on the right along the rail hold a massive amount of books and school supplies. Busy pass-through space does so much! The master has a triple bank of windows on the North side – loads of cool light and not too much heat. A huge tiled shower with river rock has a slider window in it to catch breezes. 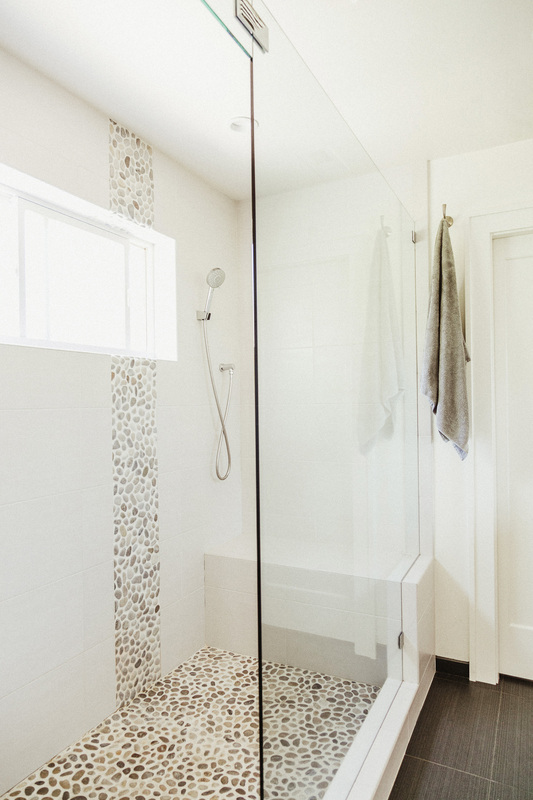 Light-filled shower with river rock tile, built-in bench, and with two shower heads – hand shower at one end, rain shower at the other. 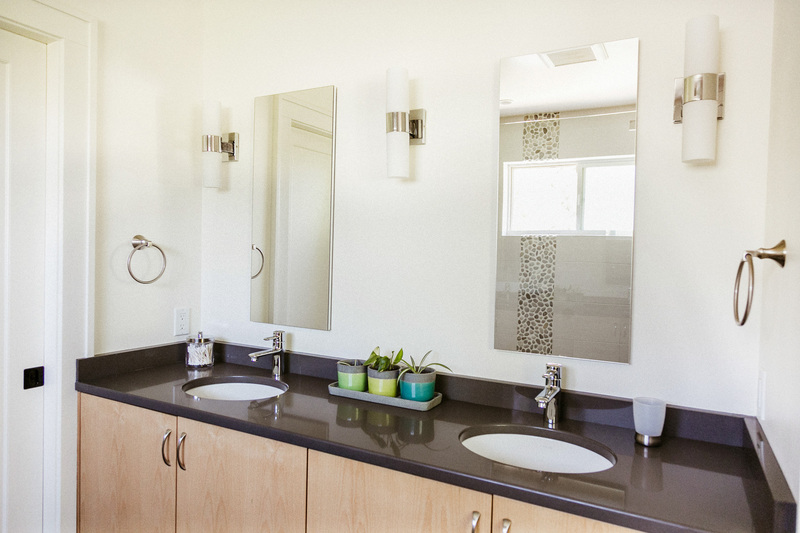 Simple lines at this custom-built double sink. The original “bonus” room has now hosted two babies! 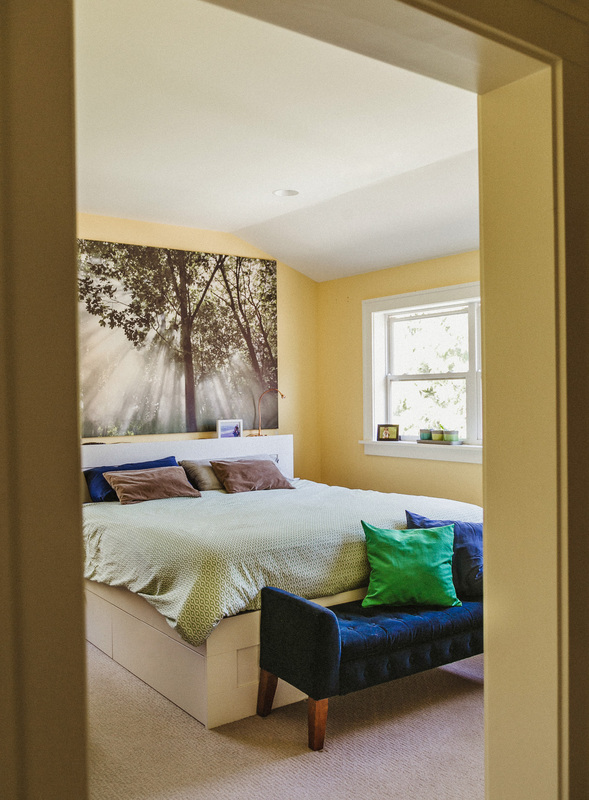 A small space but every inch is used and is perfect for crib or twin bed. 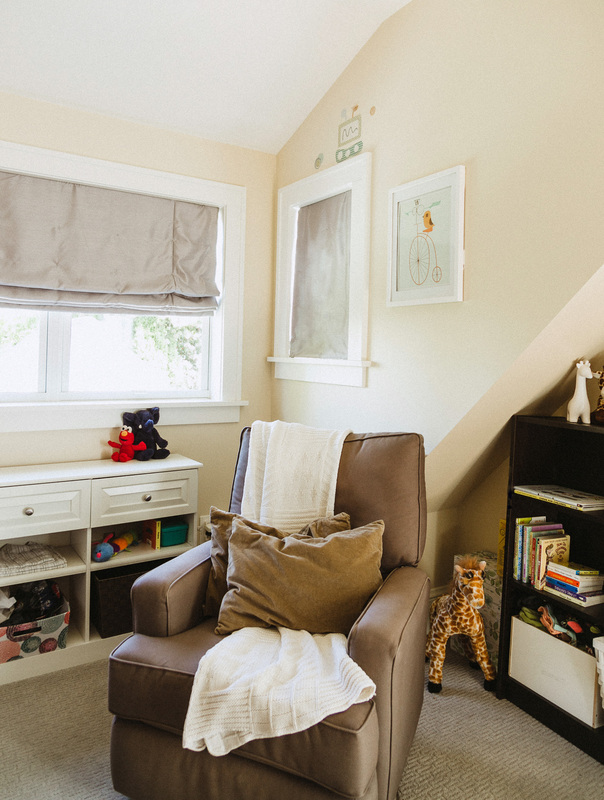 Envisioned as a bonus room, this sweet little space transitioned easily to nursery when it was needed. The contractor really took free reign in the large kid bedroom sheetrocking in all the cool angles. You can see some of that original knotty-pine panelling in the original dormer. Totally works in there. It turned out so beautiful and the contractors at Cascade Contracting did great work. On the ground level, we added a slider door to what was the Master and now is a full-time home office with a new deck and patio. Stay tuned because we are in talks to do more and I love working with them. Great clients with vision! We worked with Amanda, with vague ideas of what we could do with our upstairs. She came back with creative solutions that kept in mind how our family might change, but also how to best spend our budget. She worked with the contractor and engineer to make sure we got the best solutions to the tricky problems that always crop up when dealing with old houses. She ended up creating my favorite space in the house. 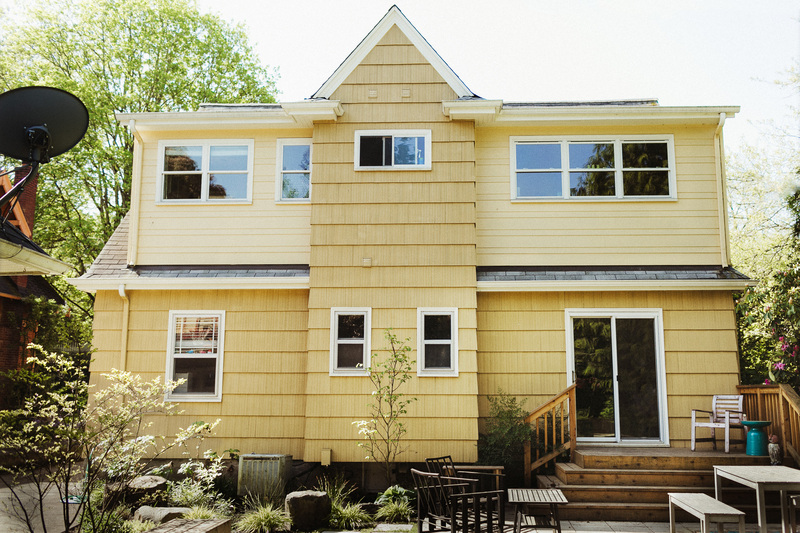 Our upstairs remains light and airy and happy all year round, even in PDX’s winter. As we plan for the next phase of our home improvement, I 100% plan on working with her.